Earlier in the summer my brother-in-law had this suit made-to-measure with Gieves & Hawkes. Normally, I don’t offer opinions on things that have not been made for me, but since I was present at the commisioining, the fittings, and have since seen it in action, I thought it would be useful to write a short review. I think it’s fair to say that the suit lived up to all the benefits of made-to-measure, but also showed its weaknesses. 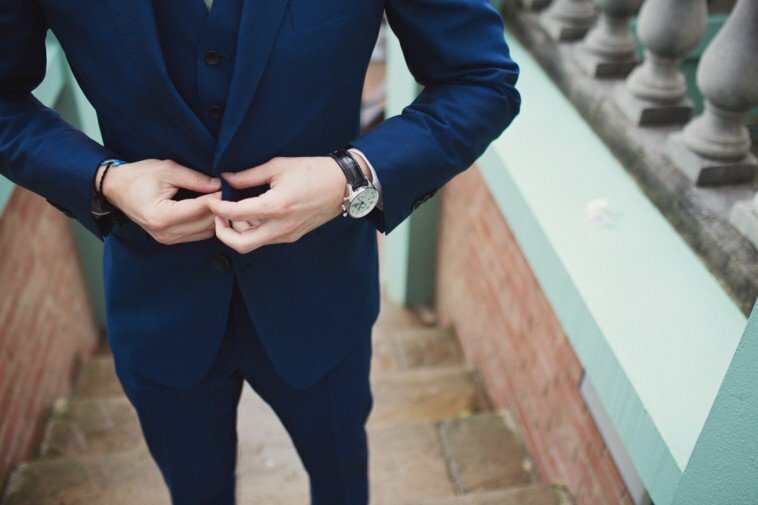 The biggest benefit is the ability to alter the proportions of a suit more than any alteration could. In this case, it gave Greg (pictured) the drop from chest to waist that he requires, given his body shape. Most suits are made with a six-inch drop – 38-inch chest for a 32-inch trouser waist. There are ways to escape this ratio, such as slimline fits with a seven-inch drop, and buying separates. But neither would have helped Greg in this case, as seven inches would have been insufficient, and the ratio he needed altering most was between chest and waist on the jacket. Nonetheless, this is not bespoke. The measurements are all two dimensional, looking at width and height, and there is therefore little opportunity to look at things like the pitch of the sleeve, the curvature of the back or the precise run through the seat of the trousers. These are the weaknesses of MTM. As to quality, this a floating, half-canvassed suit but with little handwork. The collar, to take an obvious example, is not attached by hand. Gieves do offer two levels above this, one made in Italy with a full canvas and one above that made in UK with the highest level of handwork. (The Italian is also a much softer cut.) Both are more expensive than this option, however, which was £1900 (£1495 for a two-piece). It is made in Mauritius. The material is a lightweight royal-blue mohair, which did raise the price a little. Total time to make was 10 weeks. Overall, I think it was a solid MTM experience, if on the expensive side. 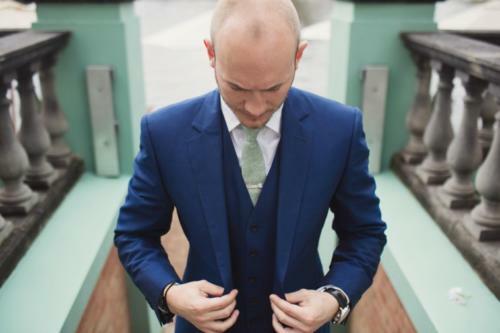 Made to measure is something Gieves is pushing more, with plans for Private Tailoring (as they call it) to include a service to preview your suit before it is made – with ability to change cloth, lapels, buttons etc and see the result on-screen. The usefulness of that, of course, will be entirely in the execution. You can follow the discussion on Gieves & Hawkes made to measure by entering your email address in the box below. You will then receive an email every time a new comment is added. These will also contain a link to a page where you can stop the alerts, and remove all of your related data from the site. Dear Simon, I regret to say that Savile Row has become a farce, suits made in China, now Mauritius, no disrespect to either of the the two aformentioned countries but this is not what the public expects or should get. As I’ve written before, people dismiss China at their peril. You can now have most things made in China to a higher quality than most British factories. Nice material and color though £2k for MTM from Mauritius is vastly overpriced, when you can pick up Graham Browne bespoke in a similar price range which should obviously fit better and would have more handwork. I suffer from a similar issue to Greg, needing suits with a 10″ drop (40″ chest 30″ waist) which outside of MTM/Bespoke restricts me largely to Austin Reed where I can mix and match or Reiss’s line of mix and match, which aren’t up to the standard of their higher priced lines. Very interesting post about the MTM process. I find MTM an atractive option only when its price is substantially inferior to bespoke, or when you want a special house cut (f.e. Orazio Luciano), but for Londoners, Graham Browne would be a better option, I think. i would have thought at that price you would get better value with a bespoke from a “lesser” brand? Simon, how do you think this would compare to the significantly cheaper bespoke offering from Graham Browne? From the pictures, it looks decent. However, the price is simply too high for MTM. Rent on the Row and Chinese ROI to blame. Wensum do a good job, but there is no way I would spend this kind of money on MTM. I got a Steed MTM for less than £1000 made up from a Smith cloth, with fitting/minor adjustments by Edwin. G&H is becoming a fashion brand. The guys who run their shop in Chester wouldn’t know what drop was. G&H is and has been a joke for years, an old heritage brand which is playing off its (long gone) history. A trap for sartorial noobs. The guys in the shop aren’t even cutters (let alone good cutters) and don’t have a clue about fit. You would be better off with RTW even from somewhere like M&S as at least the pattern would make sense and has been looked at in detail (and tolerances for the back, armhole etc are so large that you would never have any pulling going on). Either go reasonable RTW or pay up for the last of a dying breed of decent cutter (that said even most of the old saville row houses don’t have anyone that can cut properly .. inc. A&S and Huntsman). Caveat Emptor. I’m surprised you suggested Gieves MTM to your brother-in-law at that price level. I would ahve thought Jon DeBoise of Castle Tailors, or Whitcomb & Shaftesbury’s Indian bespoke offering would have been far better options. My goodness that’s a hell of a mark up. If that’s the cloth I think it is, he’d have got change out of £1200 with me through Wensum. Thank you for this very instructive post. Hey – that’s still pretty bold, but I’ll take your word for it that you’ll get plenty of wear out of it. You could certainly ask GB for something similar. It would essentially be strong-shouldered with a wide peak lapel. The only question is whether GB could replicate the roped shoulder. A little off topic, but what is the make and model of the watch your brother-in-law is wearing. Looks quite elegant. Very nice. Thank you for the information. £2k MTM suits from Mauritius or the far East is a rather disappointing relaity. It loses its magic when you learn that as soon as you’ve left the tailor on Savile Row, your details are sent off to a factory to make a “first draft”, which is then shipped to the shop front a few weeks later. I’ve bought a couple of MTM paying almost the same amount. Love the suits and fit but couldn’t help but feel a bit gutted when I researched more about the production process for MTM. Agree with most of previous posts . At that price Gieves are at risk of being exploitative . A made to measure at Austin Reed would suffice. Surely Gieves could be more competitive on the price . Thanks for a very frank article , Simon. It’s the sort of thing that makes your column stand out. I’ve had Gieves and Hawkes MTM and Graham Browne; I love both and the latter is better made (if more by hand = better), but the fit/silhouette of the former takes first prize in my opinion. And I don’t have anything against it being made in Mauritius. Need another suit soon and will probably try G&H again for MTM. There may be better value/quality out there, but I like the end product and that’s what matters! In my experience, classic Savile Row tailors (and off-Row tailors such as Graham Browne) aren’t able to make modern ‘fashionable’ suits. So if that’s what you want, and you want a suit that more or less fits, made-to-measure might be the only way to go. Timothy Everest does well at modern design, and Spencer Hart it’s another possibility, although is very expensive. Do you have anything you’d define as ‘modern design’? A few Timothy Everest pieces. But I’m a 40-something dad with a bit of a paunch so ‘young man’s clothes’ aren’t really my style (‘modern design’ probably isn’t quite the right term). I should say that Davide Taub (who I agree is superb) is another Row cutter who can no doubt make more fashion-forward clothes, judging from what he wears and the things on his blog. not sure they can be that competitive … the problem is that they probably aren’t selling many suits. therefore their gross margin has to be high to keep all their fixed overheads running, namely prime real estate and staff. the business model is broken in high end tailoring whether RTW or Bespoke. A few make very good money .. the rest I would imagine are trying to make things work, before realising the hopelessness of their cause and trying to sell off to a foreign private equity group … or a hedge fund manager who wants a pet project (ala huntsman). 1. I don’t understand high-end, pricey MTM. Do men use it simply because it’s an easier or faster process? Or because big, well known houses offer MTM (RL, Kiton, Attolini, etc) and their wares are better known than some of the small operations discussed here? I think in the early days of the blog you sought out inspiration from all corners, and then discussed it openly. This would be going back to that, in a way. Is it only me or do the shoulders look a bit off? Also, I think at least a half-dozen London tailors use Mauritius–presumably the same manufacturer–for made-to-measure. Read somewhere that Richard James manufacture in Mauritius too. I am new to this and I didn’t realize a 6 inch drop was standard. I have a 7 inch drop from a 38 inch chest to a 31 inch waist and thought that was more than normal. Is it the same situation with shirts as it is with suits? No, not with shirts. Most are made with much less drop. Have you posted on “Modern Fit,” Simon? Slimmer suits, shorter jackets, floodwater-length trousers. My clothier writes that “suits more than five years old [now], even from the best makers, will definitely look dated.” But the Modern Fit will not look dated, presumably. Nor the gingham check dress shirt. Paul, it’s more likely that suits from the past 5 years, even from the best makers, will look dated soon. At least I hope clothiers return to the centuries-old idea of fit instead of what has been pushed the last few years. Are the gorges two different heights, or just the way he’s wearing it in that photo? Be a big shame if they were, given where they’re from. Modern fashion- the ‘Max Wall look’ wouldn’t be the best investment for bespoke, I dare suggest. The too-tight TF suits in Skyfall look like they’ll age badly, for example. Each to their own though, naturally..
“The Max Wall look”. Spot on. I love it. Excellent and timely article as it raises many issues about tailoring, cost, value and place of manufacture. Especially against the backdrop of the alarming news re. Spencer Hart. Is it that SR, collectively, continues to place itself as a luxury brand in terms of location, product and price (and therefore related costs) but is unable to generate economies of scale in manufacture (see Brioni) or generate scale in sales to cover these costs? I do not think that whether or not a suit is canvassed sould be a part of the equation in terms of cost since the suits you buy in Japan at The Suit Company and the likes all have floating canvassed chests and are priced at an ridiculous £200 (made in China of course). And mind you the sleeves are perfectly attached. and therefore its long term profitability. I simply question the business model which for some, at different periods, must be precarious. That Gieves is sending to Mauritius (rather than looking to find a UK model) clearly asks whether this model is working properly. Timely post as I was measured for my first bespoke suit from Graham Brown today. It is a replacement for a classic dark navy made to measure suit. The new suit will be a slim fit 2 button jacket cut on the shorter side. Flat fronted trousers sat on the hips with minimal break. All in a dark navy super 130 birds eye. The bit I’m pondering is whether to go peak lapels almost to the style of Nutter or Tom Ford, but worry if done badly it will contradict the remainder of the suit. Your thoughts? The second query is one over process. I was measured today (and need to pop in to confirm the above) but what surprised me is that they didn’t take any more measurements than when I got my MtM; it may have been fewer actually. I was expecting lots more, or is that something which waits to the baste fitting? I’d avoid peak lapels on an initial bespoke – it could easily age the suit and that would be frustrating with a large investment. I need an excellent odd jacket to wear with trousers for an event. Budget would be under £700 for the jacket. I quite like some of Gieves and Hawkes jackets at the moment but I am wondering if you have any suggestions of brands or tailors (in London) that could fall into that budget. I would like quite a formal but slim cut style. Do you have contact details or know of any suppliers of quality MTM suits in, say, Italy, UK, etc? just read this post; and will say am a little confused! People tend to turn their noses up at MTM (including the Gieves offering) – but pls let me know what the alternative scenario for someone like my father is, who is between 42S and 44S? As I can see it, he only has the choice of 1) buying a RTW that doesn’t fit for anywhere between £750 – £1k or 2) spending £3.5k+ on bespoke, or 3) buying a MTM at Gieves for £1.2k? Am I missing something here? Are there tailors who are very good but because they are not from a celebrity / well known establishment that could offer what we are looking for? I agree, but I think it is ridiculous that the clothing industry is set-up in such a way that unless you have at least £1.2k, you cannot get a suit that fits you properly if you are not an exact standard measurement. the average person cannot spend that much, so are they relegated to wearing ill fitting suits? 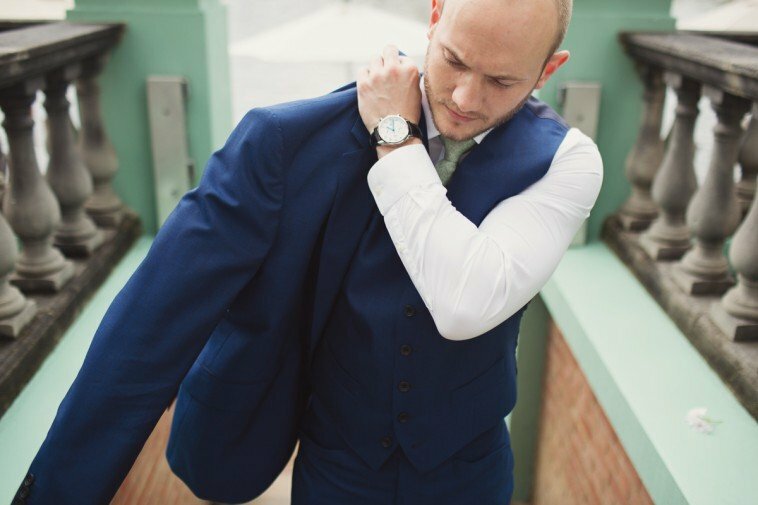 Separately – regarding quality of staff doing fitting – I think the most amazing is Mark Powell. Even altering his RTW – the guy is a genius and does the most perfect alterations in about 3 mins and with one glance.